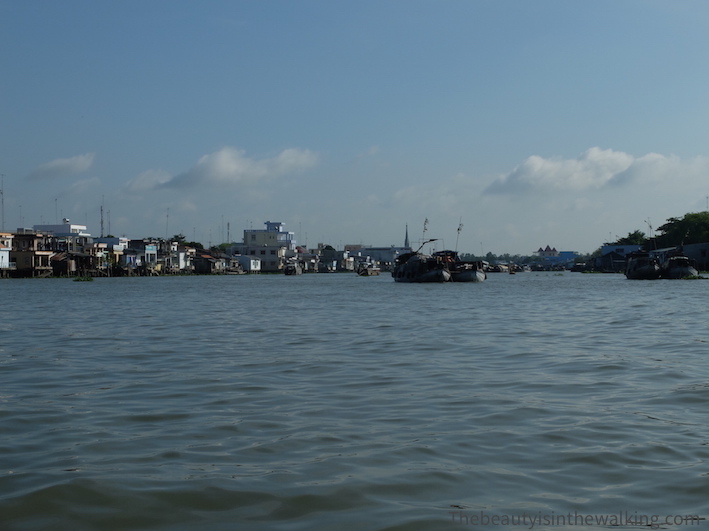 The Mekong Delta, or đồng bằng sông Cửu Long in Vietnamese, which literally means the delta of the nine dragons, is this huge area of 39 000 km2 spread over twelve provinces in the south of Vietnam. 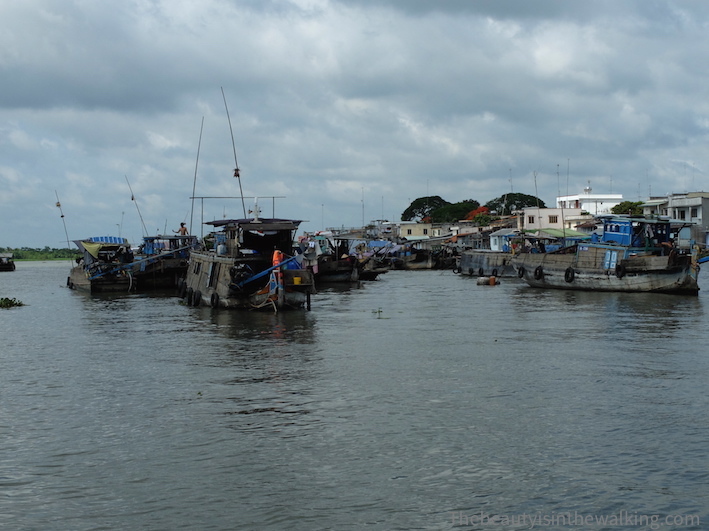 This is where the Mekong River flows into the South China Sea. 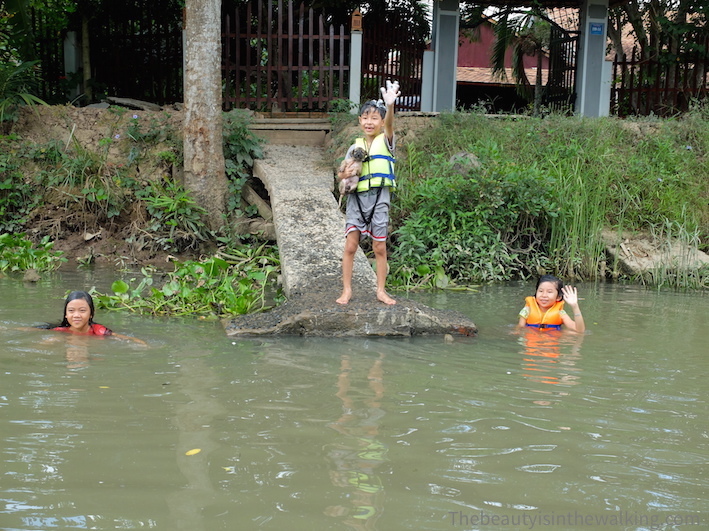 We had already met with this mythic river in Thailand and we met it again and again, in Laos, then in Cambodia. 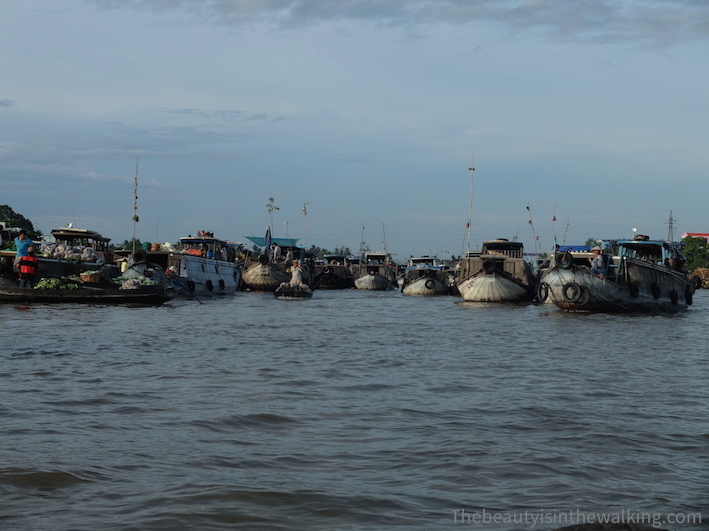 Now, we are happy to see it again here, a few thousands of kilometres further away to wish it a last goodbye in the Mekong Delta. 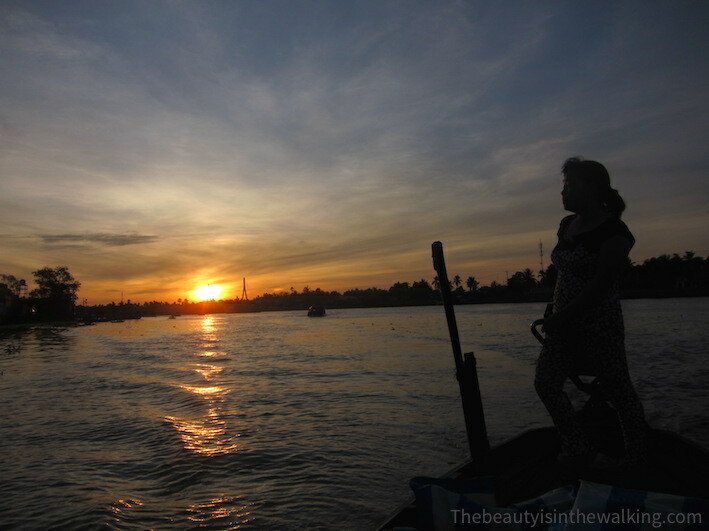 More than 4350 km long, the Mekong River has its source in the Himalayas, in a province of northwest China called Qinghai, then flows along through a part of Myanmar, Thailand, Laos and through Cambodia. 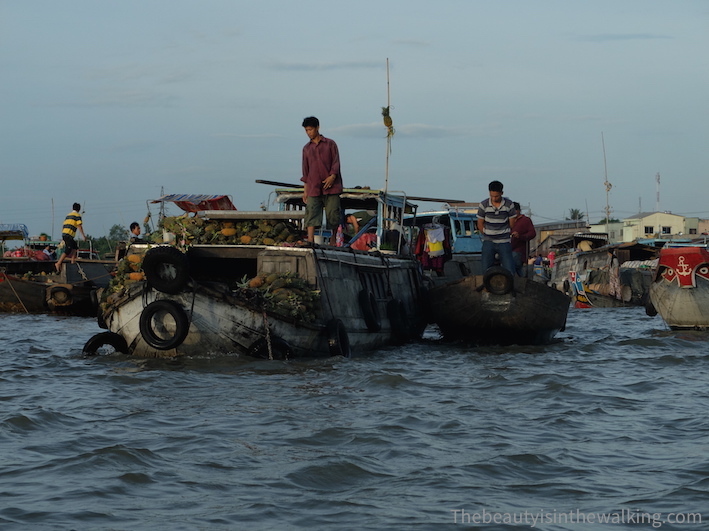 It comes to an end in the south of Vietnam in a fertile delta, a huge agricultural region, in particular for rice growing (almost all the Vietnamese rice production is grown in this region). 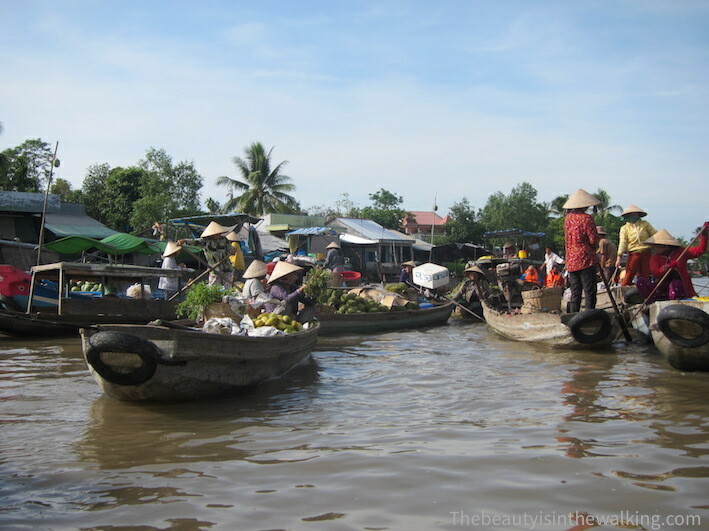 The Mekong Delta is an orchard as well as a fishing pond. It’s also in such a place that we finally get to know Vietnam, after having crossed the border in Hà Tiên from the Cambodian coast and also after a delightful little detour by the Phú Quốc Island to lounge for a while on beautiful beaches, fortunately abandoned by tourists in this month of May that closes the high season. 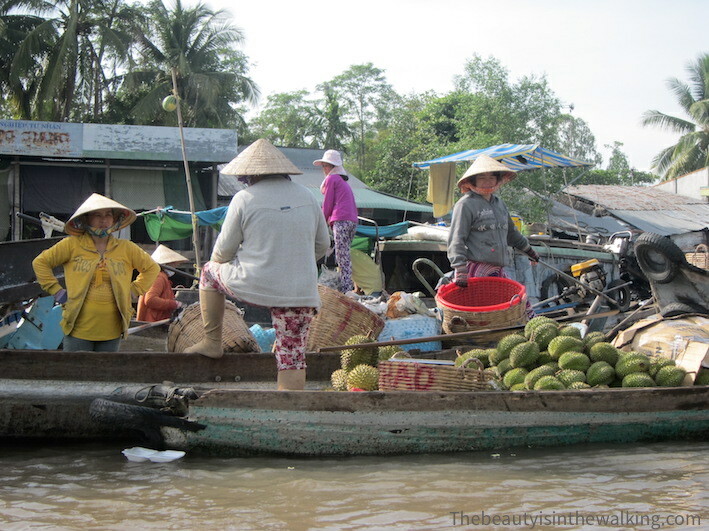 The main attraction of the Mekong Delta region is with no doubt the so typical floating markets that make it so charming. 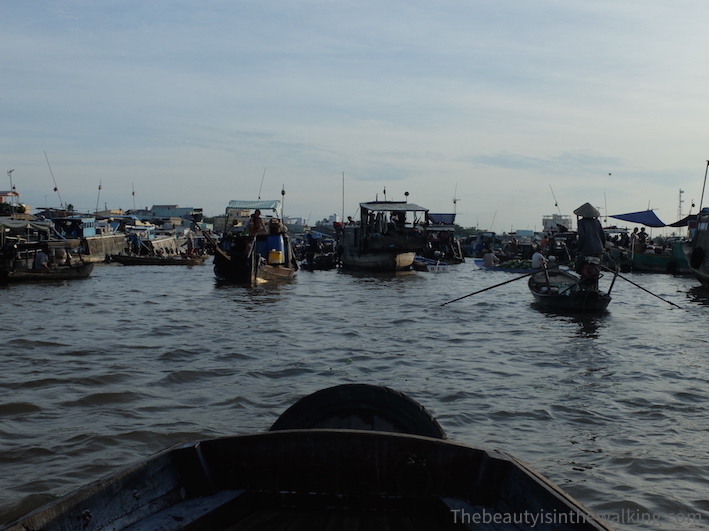 The city of Cần Thơ, with no less than 1.2 million inhabitants, is the biggest city in the Delta. 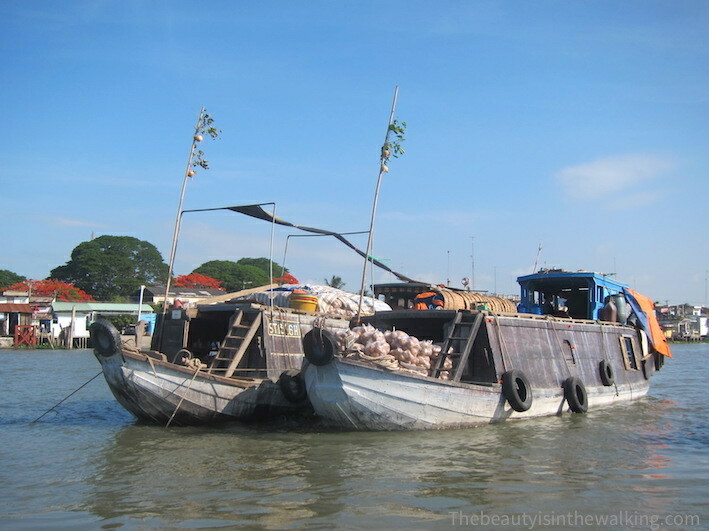 It has two particular and well-known important floating markets. 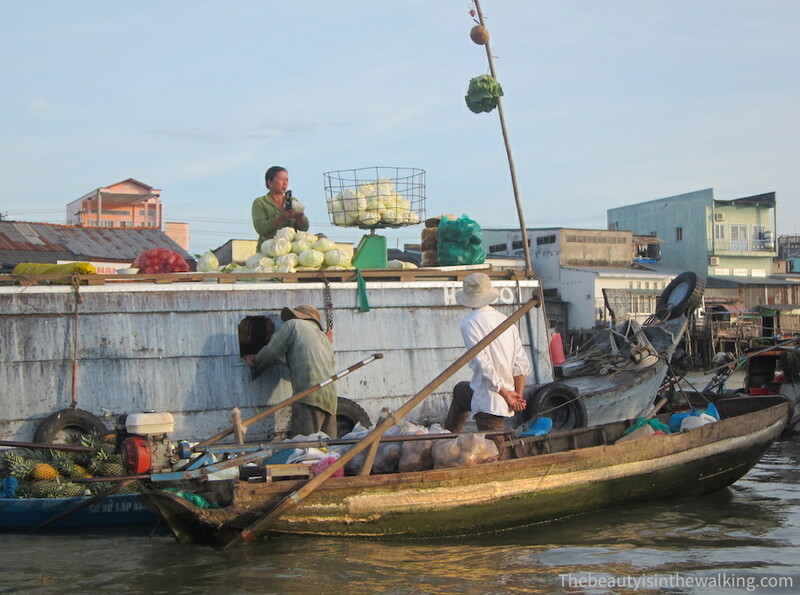 Situated at four kilometres from Cần Thơ city centre, Cái Răng is the most important wholesaler floating market of the Mekong Delta. Better leave early, before the sun rises, and arrive when its activity is in full swing. 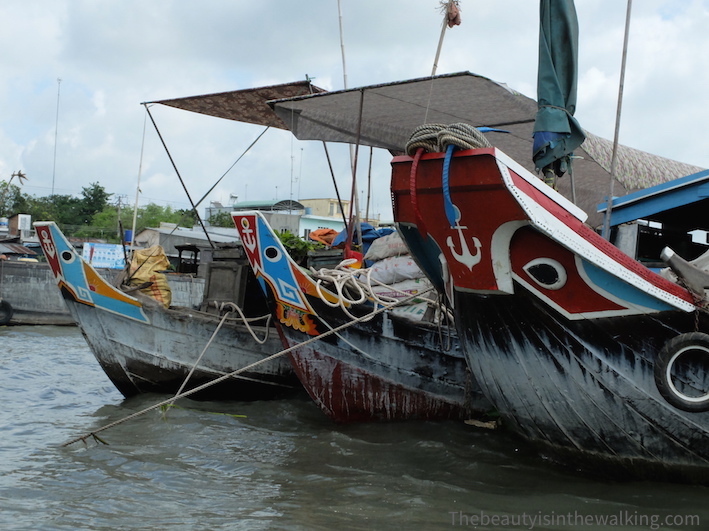 Many big wooden boats come alongside the ones to the others, with by way of a sign a long wooden stick to which they hang up a sample of what they sell. 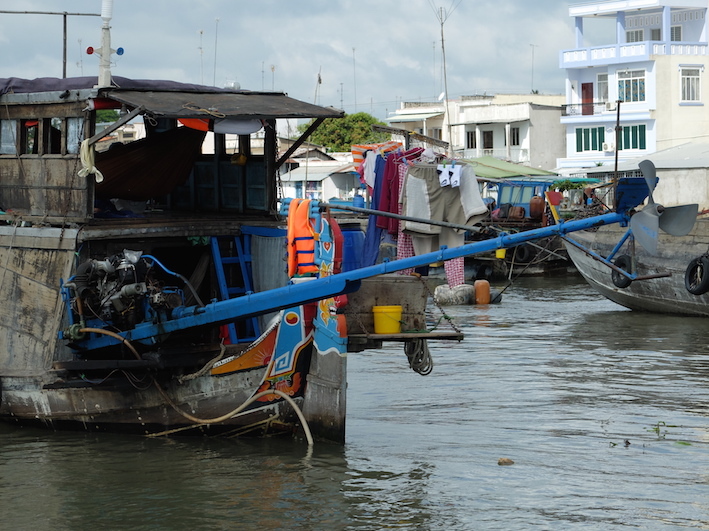 Their bow, often coloured in red and white, shows that the owners live on their boat during the time they sell off the goods. 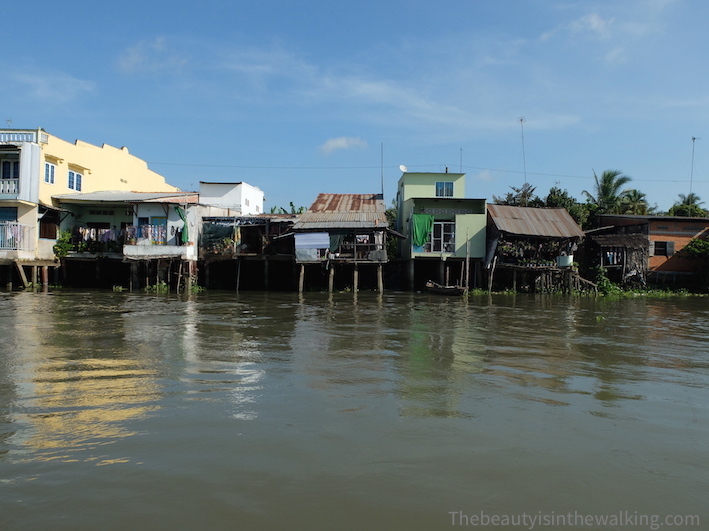 Smaller and much further away – about a good hour by boat from Cần Thơ –, Phong Điền floating market is worth the trip because it is really charming. 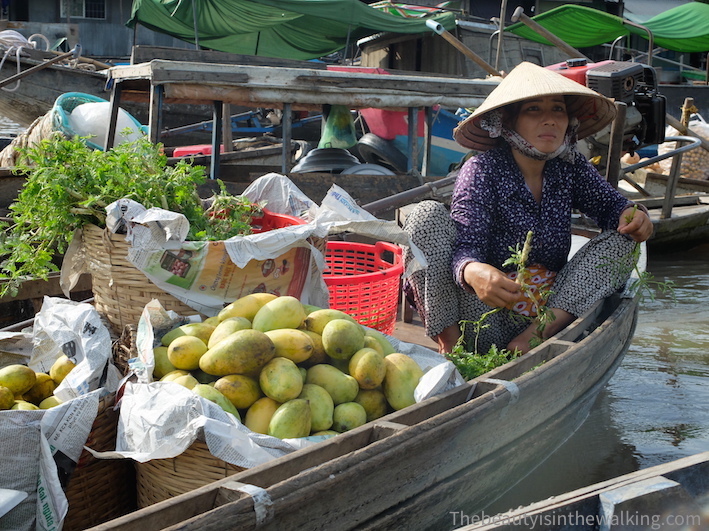 Women – mainly – with a conical hat on the head sell fruits, vegetables, clothes, etc. on their small boats that they manoeuvre with two crossed paddles. 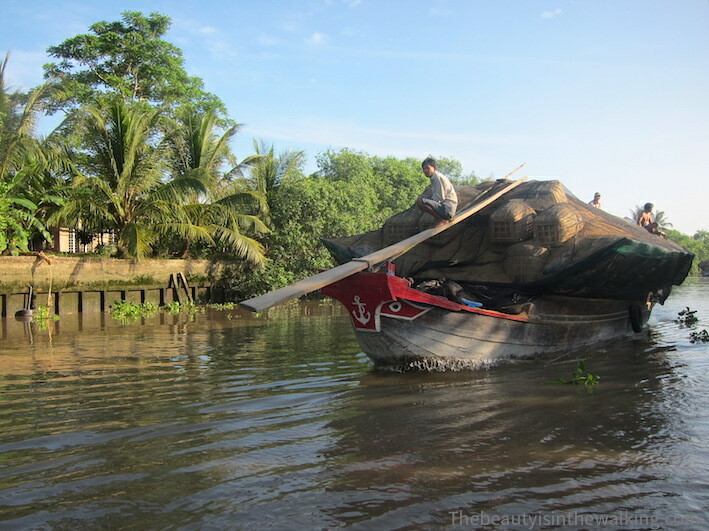 Then we can continue the visit towards the many orchards and little canals in the surroundings. 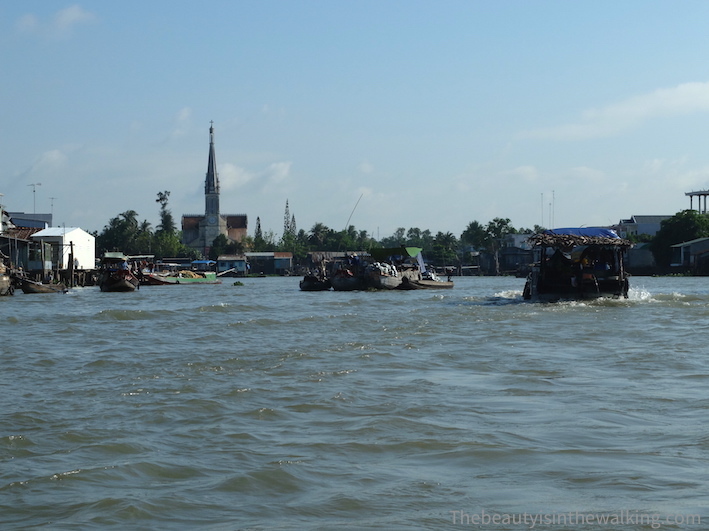 Not far from the green little island of An Bình where we stayed, Cái Bè floating market has nothing extraordinary compared to those we went to before. Particularly as we did arrive a little bit late, despite the fact that our Captain Haddock, who took us there, manoeuvred his boat to perfection. And yet, as we arrived the city had something aesthetic with its rows of houses on stilts and, in the distance, its astonishing church in a completely different style. 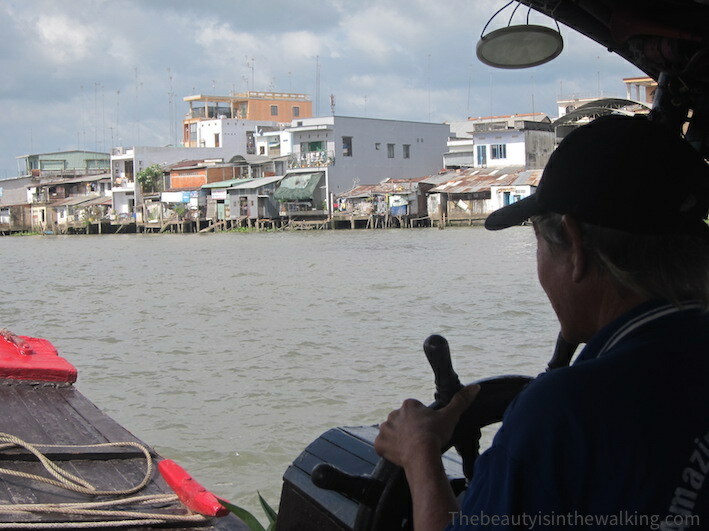 And above all, what is absolutely lovely is to continue the trip throughout the surrounding canals. 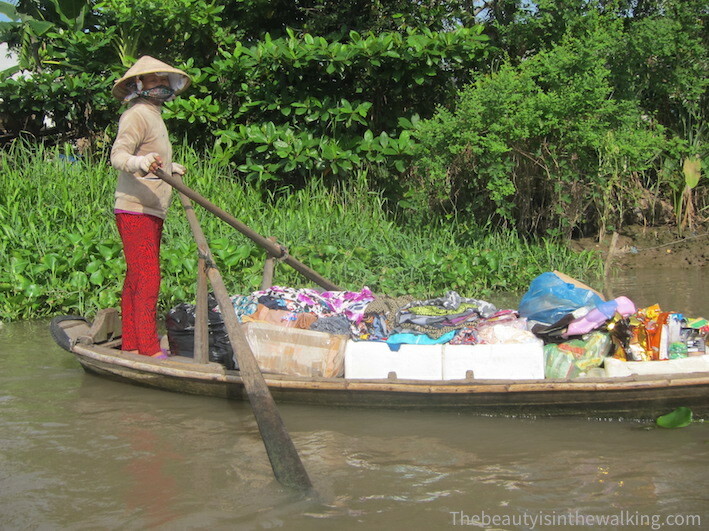 How to visit floating markets? 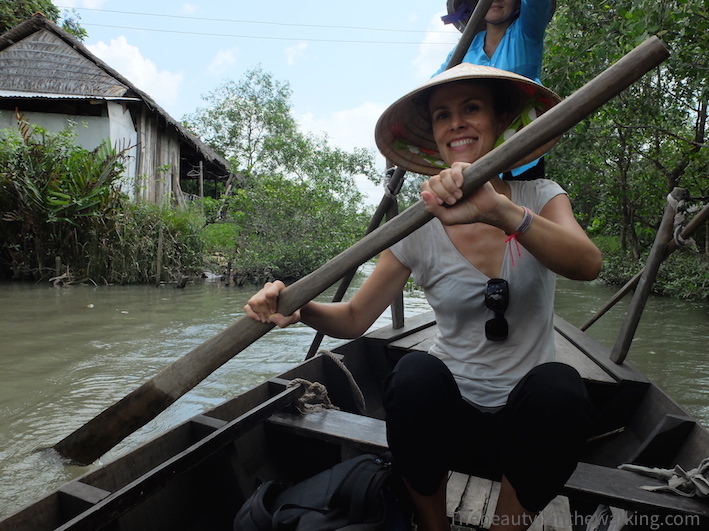 Many guided tours exist to visit the floating markets and you can book one of them through your accommodation or in town (no worries, you’ll got many propositions!). Which markets are worth visiting? 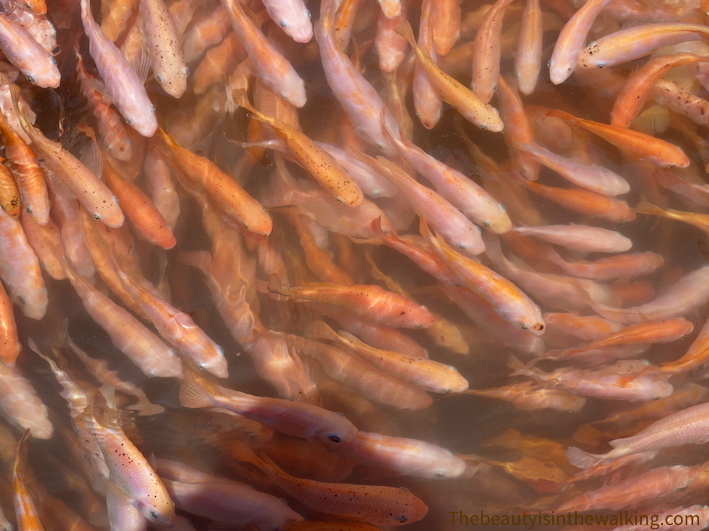 In Cần Thơ, Cái Răng market is the biggest and most of the tours propose to visit only this one. It must be seen of course, but there are also other smaller markets that are worth paying a visit, like Phong Điền market, which is further. We asked our guesthouse that sold us the tour to do both. (For info, we paid 840 000 dongs for the tour with an English-speaking guide). Ask for an English-speaking guide: if you want information, don’t forget to ask for an English-speaking guide, otherwise you will miss a lot. 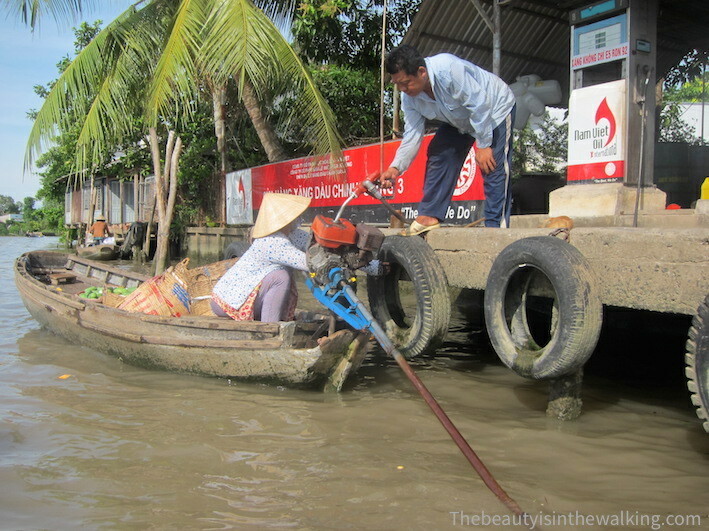 Be careful because you will be said that the boat driver speaks English but most of the time their English is very poor. 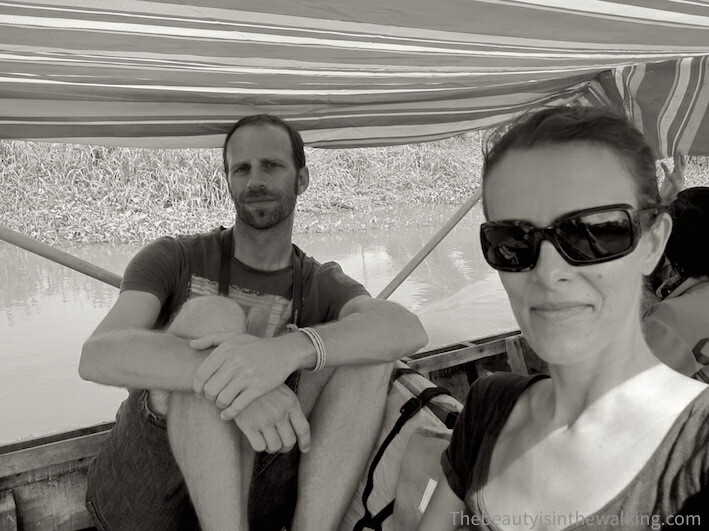 What we did: we insisted to have a real English-speaking guide and proposed to pay more for that (It is no secret!). And we were very happy about that! 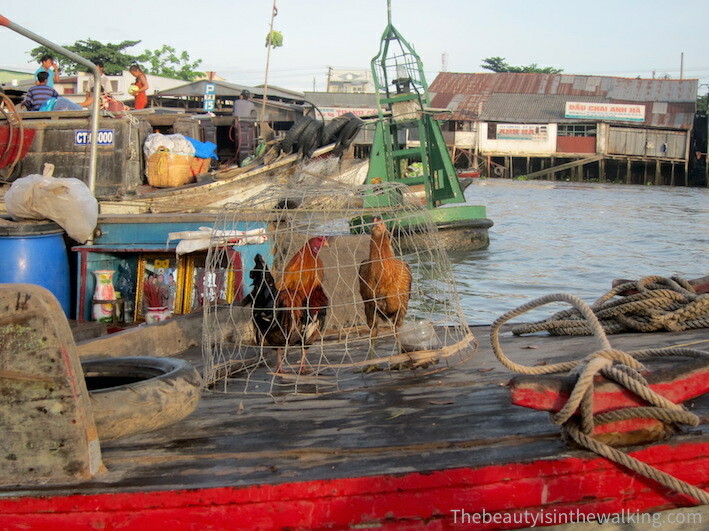 There are so many interesting things to know about the floating markets. Leave very early: don’t be afraid of being insistent; ask to leave early, at least at 6 o’clock in the morning, well before sunrise. 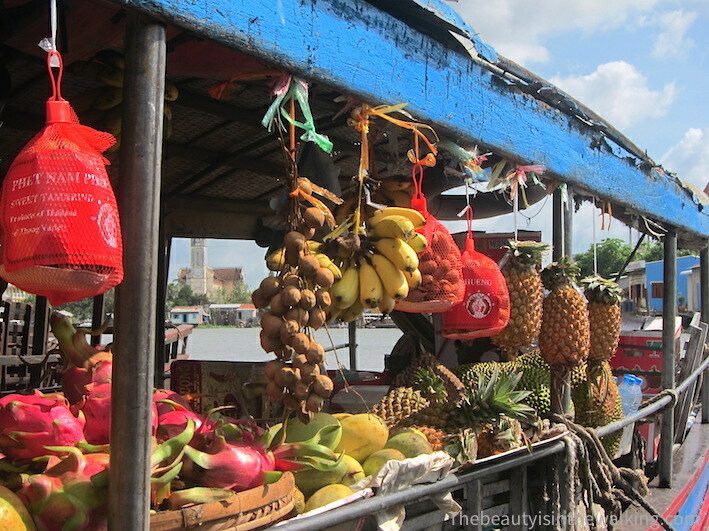 It is the best moment to visit the floating markets because first of all the light is gorgeous, and also because the markets start very early. 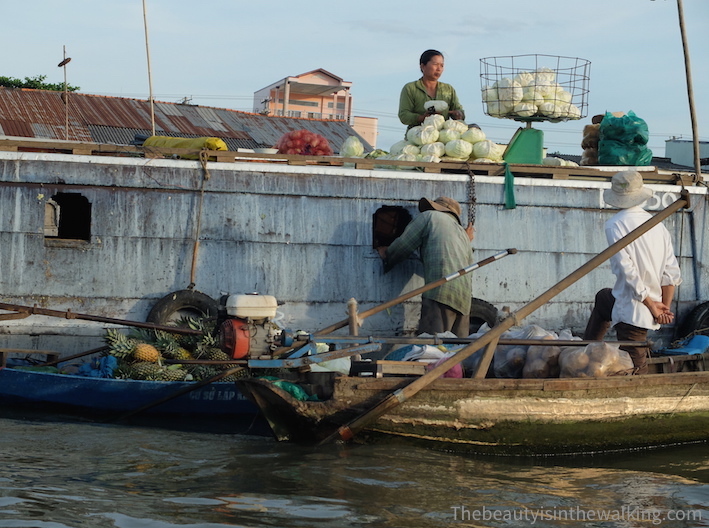 In Cần Thơ, from 7-8 o’clock in the morning, lots of vendors have already started naptime.